A 15-year-old boy hiking in Mililani Mauka fell to his death yesterday from an 80- to 100-foot cliff into a stream bed in Launani Valley. His 10-year-old brother witnessed the accident along with two friends. Police said the four had gone hiking along a dirt trail behind a new housing development in Mililani Mauka. The teen sat on a rock, which gave way, sending him over the cliff, police said. The accident occurred shortly before 2 p.m., and the boy was pronounced dead at 2:45 p.m., an Emergency Services Department spokesman said. A friend of the Mililani Mauka family, who declined to give his name, said the brother and other boys ran back to their house and told his parents he fell. The friend and the family drove to Kelakela Street behind vacant homes and were looking over the cliff. "We were hollering for him, 'R.J., R.J.,'" said the friend. "We thought maybe he got hung up" along the cliffside. But a person at the base of the cliff shouted, "He's here; he's not moving," and they drove down to Launani Valley, the friend said. "I saw him in the stream bed," he said. "We knew right then. "You think about what was going through his mind" as he fell, he said. He pointed out the steep, bare red dirt area, which he said most people would be afraid to walk along, he said. "Whose responsibility is it? Where does responsibility lie?" asked the friend, who is also a Mililani Mauka resident in a subdivision above. 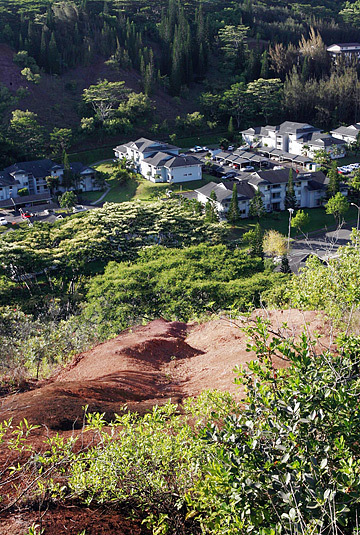 A 15-year-old boy died yesterday after falling 80 to 100 feet into a ravine at Launani Valley. The boy was with his 10-year-old brother and friends on this mountainside behind 1044 Kelakela St. in Mililani Mauka. Residents in the newly developed area said a fence and warning signs could have helped prevent the accident. He acknowledged the youngsters should not have been playing there, but he said a fence by the developer might have discouraged them from going back there. Sgt. Paul Ledesma said neighbors have seen kids sitting along the edge of the cliff but that this was the first accident there. A woman who lives near where the body was found said she has seen youngsters playing high above the stream bed. She brought up the subject at the previous night's board meeting of the Launani Valley Community Association. Board members planned to approach developer Castle & Cooke yesterday. 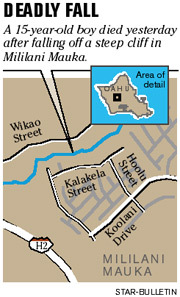 On Kelakela Street in the American Classics subdivision of Mililani Mauka, one homeowner who moved in last Friday said he has seen youths playing behind the new homes, but most had not. Elaine Spence, who lives across the street from the ridge line, said, "That's the reason why we live on this side, because we don't want to live on the cliffside. "Me and my husband were down there, and we saw how steep it is," she said. "They should put up a fence." Spence said she does not allow her children to play outside without her supervision. Even her 14-year-old son must call as soon as he comes home from school. "That's how paranoid we are," she said. Tanner Joyce, 12, said he does not think about playing beyond his back yard because his neighbor had warned him that the hillside "just drops off." "We want to send out our condolences to the family," said Carleton Ching, director of community and government relations for Castle & Cooke. "It's unfortunate." The company's construction workers immediately contacted the office. Ching said he does not know who owns the property behind the house lots, and he did not have all the facts. The lots are set back well away from the ridge, and there is a buffer for fire protection, he said.